Coal bottom ash and boiler slag are coarse, granular, incombustible materials that are collected from the bottom of furnaces that burn coal. The majority of coal bottom ash and boiler slag are produced at coal-fired electric utility generation stations, although bottom ash and boiler slag are produced by industrial and institutional coal-fired boilers and also from independent coal-burning electric generation facilities. The type of bottom ash or boiler slag produced depends on the type of furnace. There are two types of wet-bottom boilers that produce boiler slag: slag-tap and cyclone. The slag-tap boiler burns pulverized coal while the cyclone boiler burns crushed coal. Wet-bottom boiler slag is a term that describes the molten condition of the ash being drawn from the bottom of the furnaces. Both boiler types have a solid base with an orifice that can be opened to permit molten ash to flow into a hopper below. The hopper in wet-bottom furnaces contains quenching water. When the molten slag comes in contact with the quenching water, the ash fractures instantly, crystallizes, and forms pellets. High-pressure water jets wash the boiler slag from the hopper into a sluiceway which then conveys the ash to collection basins for dewatering, possible crushing or screening, and stockpiling. (4) The resulting boiler slag, often referred to as "black beauty", is a coarse, angular, glassy, black material. 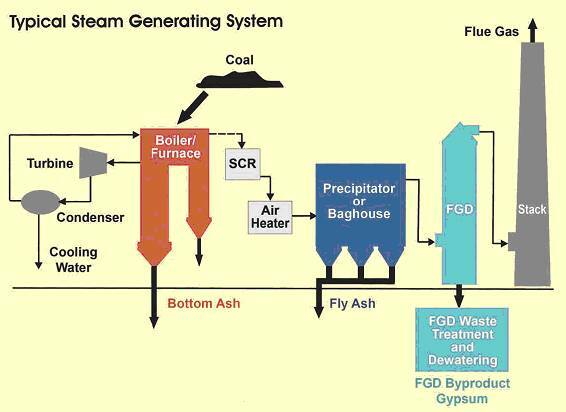 A general diagram depicting the coal combustion steam generation process and the ash collecting points is presented in Figure 1. As shown in Figure 1, bottom ash or boiler slag is collected directly from the boiler/furnace and requires no separate system to collect the ash. 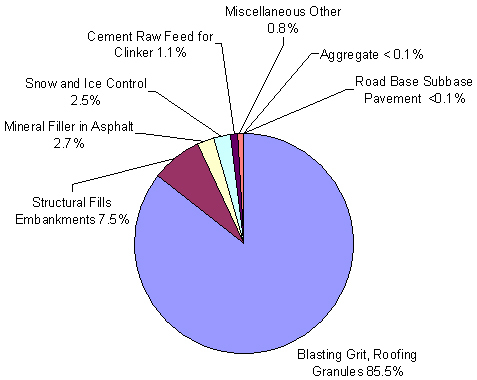 According to 2006 statistics on bottom ash usage, just over 45 percent of all bottom ash produced is used, mainly in transportation applications such as structural fill, road base material, and as snow and ice control products. (3) Bottom ash is also used as aggregate in lightweight concrete masonry units(6) and raw feed material for the production of Portland cement. (3;7;8) As the acceptance of the use of bottom ash increases, these markets have the potential to utilize all of the bottom ash produced annually in the U.S.(5) Figure 2 illustrates the common applications of coal bottom ash. Discarded bottom ash and boiler slag are either landfilled or sluiced to storage lagoons. When sluiced to storage lagoons, the bottom ash or boiler slag is usually combined with fly ash. This blended fly ash and bottom ash or boiler slag are referred to as ponded ash. Ponded ash is useable, but the engineering properties and behavior of ponded ash may vary and be similar to either fly ash or bottom ash-boiler slag, depending on the ratio of each in the ponded ash. (11) Because of differences in the density and particle size of fly ash and bottom ash-boiler slag, the coarser bottom ash-boiler slag particles settle first and the finer fly ash remains in suspension longer, thus producing a segregated layered deposit. Ponded ash can be reclaimed and stockpiled, during which time the ponded ash is dewatered. Under favorable drying conditions, ponded ash may be dewatered into a range of moisture that is near optimum moisture content. The higher the percentage of bottom ash-boiler slag, the easier ponded ash is to dewater. Reclaimed ponded ash has been used in stabilized base or subbase mixes and in embankment construction and can also be used as fine aggregate or filler material in flowable fill. The U.S. Environmental Protection Agency (EPA) has delegated responsibility to the states to ensure that coal combustion by-products are properly used. Each state, therefore, should have specifications and environmental regulations. A map from the National Energy Technology Laboratory that links to a database of state regulations on the utilization and disposal of coal combustion by-products can be found here. The state regulations database contains summary information on current regulations in each state and contact information for individuals with regulatory responsibility. A site maintained by the U.S. Federal Highway Administration (FHWA) contains a searchable library for all highway specifications across the country. This can be found here. Although coal-burning electric utility companies produce ash, most utilities make use of commercial ash vendors to sell ash. In addition to commercial ash marketing firms, some coal-burning electric utility companies have formal ash marketing programs. Most coal-burning electric utility companies currently employ an ash management specialist whose responsibility is to monitor ash generation, quality, use, or disposal, and to interface with ash marketers. To identify an ash source, contact the local utility company or visit the American Coal Ash Association's web site at the like provided above. Both bottom ash and boiler slag have been used as fine aggregate substitute in hot mix asphalt wearing surfaces and base courses, and in emulsified asphalt cold mix wearing surfaces and base courses. Bottom ash is more commonly used in base courses than wearing surfaces, although recent field and laboratory research has shown that hot mix asphalt with up to 15 percent bottom ash had comparable performance to control mixes. (12) Because of the hard durable particles, boiler slag has been used in wearing surfaces, base courses, and asphalt surface treatment or seal coat applications. Both bottom ash and boiler slag have occasionally been used as unbound aggregate or granular base material for pavement construction. Bottom ash and boiler slag are considered fine aggregates in this use. To meet required specifications, the bottom ash or slag may need to be blended with other natural aggregates prior being used as a base or subbase material. Screening or grinding may also be necessary particularly for the bottom ash, where large particle sizes greater than 19 mm (3/4 in) are present in the ash. Bottom ash and boiler slag have been used in stabilized base applications. Stabilized base or subbase mixtures contain a blend of aggregates and cementitious materials that bind the aggregates to increase bearing strength. Types of cementitious materials typically used include Portland cement, cement kiln dust, or pozzolans with activators, such as lime, cement kiln dusts, and lime kiln dusts. These cementitous properties have been found in both coal bottom ash and boiler slag which make them attractive options for stabilized base. The pozzolanic or cement-like activity of these materials, which contributes to the time-dependent change in mechanical properties, can be controlled by adjusting the particle size through grinding. It should be kept in mind, however, that grinding is an expensive and time consuming process. (14) When constructing a stabilized base using either bottom ash or boiler slag, both moisture control and proper particle gradation are required. Deleterious materials such as pyrites should be removed. Bottom ash and ponded ash have been used as structural fill materials for the construction of highway embankments and/or the backfilling of abutments, retaining walls, or trenches. These materials may also be used as pipe bedding in lieu of sand or pea gravel. To be suitable for these applications, the bottom ash or ponded ash should be near the optimum moisture content and free of pyrites and/or popcorn-like particles. For use as trench fill around pipes the ash should be non-corrosive. Reclaimed ponded ash must be adequately dewatered prior to use. Bottom ash may require screening or grinding to remove or reduce oversize materials, greater than 19 mm (3/4 in) in size. Bottom ash has been used as an aggregate material in flowable fill mixes. Ponded ash can also be used in flowable fill. Since most flowable fill mixes require low compressive strength to allow for future excavation, no processing of bottom ash or ponded ash is typically needed. Neither bottom ash nor ponded ash needs to be at any particular moisture content to be used in flowable fill mixes because the amount of water in the mix can be adjusted in order to provide the desired flowability. Bottom ashes have angular particles with very porous surface textures. The ash particles range in size from a fine gravel to a fine sand with very low percentages of silt-clay sized particles. Bottom ash is predominantly sand-sized, usually with 50 to 90 percent passing a 4.75 mm (No. 4) sieve and 0 to 10 percent passing a 0.075 mm (No. 200) sieve. The largest bottom ash particle sizes typically rang from 19 mm (3/4 in) to 38.1 mm (1½ in). Bottom ash is usually a well-graded material although variations in particle size distribution may be encountered in ash from the same power plant. Figure 4 compares the grain size distribution curves of bottom ash samples from several sources. Boiler slag has a smooth surface texture unless gases are trapped in the slag when quenched, which produces a vesicular or porous particle. Boiler slag from the burning of lignite or subbituminous coal tends to be more porous than from burning eastern bituminous coals. (18) Boiler slag is essentially a coarse to medium sand with 90 to 100 percent passing a 4.75 mm (No. 4) sieve and 5 percent or less passing a 0.075 mm (No. 200) sieve. (4) The grain size distribution curves of several boiler slag samples are shown in Figure 5. The specific gravity of the dry bottom ash is a function of chemical composition, with higher carbon content resulting in lower specific gravity. Bottom ash with a low specific gravity has a porous or vesicular texture, a characteristic "popcorn particle" that readily degrade under loading or compaction. (19) Table 1 lists physical properties of bottom ash and boiler slag. Table 1. Typical physical properties of bottom ash and boiler slag. The chemical composition of bottom ash and boiler slag particles is controlled by the source of the coal and not by the type of furnace. Coal ash is composed primarily of silica (SiO2), ferric oxide (Fe2O3), and alumina (Al2O3), with smaller quantities of calcium oxide (CaO), potassium oxide (K2O), sodium oxide (Na2O), magnesium oxide (MgO), titanium oxide (TiO2), phosphorous pentoxide (P2O5), and sulfur trioxide (SO3). In bituminous coal ash, the three major components (SiO2, Fe2O3, and Al2O3) account for about 90 percent of the total components, whereas lignite and subbituminous coal ashes have relatively high percentages of CaO, MgO, and SO3. (20) Figures 6 and 7 present a chemical analysis of selected samples of bottom ash and boiler slag. Sulfate, not shown in either Figures 6 or 7, is usually very low (less than 1.0 percent), unless pyrites are present in bottom ash or boiler slag. Typical mechanical properties of bottom ash and boiler slag are listed in Table 2 including: compaction characteristics, durability, shear strength, bearing strength, resilient modulus, and hydraulic conductivity. Table 2. Typical mechanical properties of bottom ash and boiler slag. Boiler slag usually exhibits less abrasion loss and soundness loss than bottom ash because of the glassy surface texture and lower porosity. (30) Coal pyrites or soluble sulfate that are sometimes in bottom ash or boiler slag, may account for the sodium sulfate soundness loss values. (30) Reported friction angle values are within the same range as those for well-graded angular sand and are higher that Ottawa sand. (19;24) The internal friction angle of both bottom ash and boiler slag enables these materials to be used in properly designed slopes. Compacted bottom ash used as a working platform and subsequently as a contributing subbase member in flexible pavement design has been studied. (26;23;25) California Bearing Ratio percentages as well as regression coefficients for the power function model to calculate resilient modulus, MR, are shown in Table 2. California Bearing Ratio values are comparable to those of high-quality gravel base materials. Laboratory and case study results show that with proper design and construction, compacted bottom ash provides adequate support as a working platform or subbase material. (26;25) Design charts for selecting the equivalent thickness of compacted bottom ash for working platforms are provided in reference 23, where a methodology for including the structural contribution of working platforms made from bottom ash or other alternative material is presented in 25. Leachate studies conducted according to methods outlined in Table 3 would provide valuable information in gauging the environmental suitability of coal bottom ash and boiler slag. Aside from laboratory testing, lysimeter monitoring can provide field information on trace element release and leachate flow. A lysimeter is a device that collects water from overlying materials that can be tested for soluble constituents that were dissolved during rainwater percolation through the material. Models currently used to simulate leaching from pavement systems and potential impacts to groundwater include STUWMPP,(34) IMPACT,(35) HYDRUS-2D,(36)(37)(38)WiscLEACH,(39) and IWEM. (40) Among these models STUWMPP, IMPACT, WiscLEACH and IWEM are in the public domain. STUWMPP employs dilution–attenuation factors obtained from the seasonal soil compartment (SESOIL) model to relate leaching concentrations from soils and byproducts to concentrations in underlying groundwater. IMPACT was specifically developed to assess environmental impacts from highway construction. Two dimensional flow and solute transport are simulated by solving the advection dispersion reaction equation using the finite difference method.(39). The U.S. EPA's Industrial Waste Management Evaluation Model (IWEM), although developed to evaluate impacts from landfills and stock piles, can help in determining whether ash leachate will negatively affect groundwater. IWEM inputs include site geology/hydrogeology, initial leachate concentration, metal parameters, and regional climate data. Given a length of time, the program will produce a leachate concentration at a control point (such as a pump or drinking well) that is a known distance from the source. In addition, Monte Carlo simulations can provide worst-case scenarios for situations where a parameter is unknown or unclear. In comparing IWEM to field lysimeter information, IWEM over predicted the leachate concentrations and could be considered conservative. Overall, however, IWEM performed satisfactorily in predicting groundwater and solute flow at points downstream from a source. (41) A byproducts module for IWEM will be offered by the EPA in the near future. Finally, due to the variability in bottom ash and boiler slag composition between coal plants, industry-wide generalizations about the environmental impact of bottom ash and boiler slag cannot be made. Also, because of the variety of leachate testing methods and the variety of standards and regulations to compare these test results to, state regulations should be identified and followed when determining the environmental suitability of bottom ash or boiler slag from a particular source. A searchable version of the references used in this section is available here. A searchable bibliography of bottom ash and boiler slag literature is available here. Rogbeck J, Knutz A. Coal bottom ash as light fill material in construction. Waste Management 1996;16(1-3):125-8. American Coal Ash Association (ACAA). 2006 coal combustion product (CCP) production and use. Aurora, CO: American Coal Ash Association; 2007. Moulton LK. Bottom ash and boiler slag. In: Proceedings of the third international ash utilization symposium. Washington, DC: U.S. Bureau of Mines; 1973. NETL National Energy Technology Laboratory. Clean coal technology: Coal utilization by-products. Washington, DC: Department of Energy Office of Fossil Energy; 2006 August. Topical report no. 24. ASTM C331-05 standard specification for lightweight aggregates for concrete masonry units. In: Annual book of ASTM standards. West Conshohocken, Pennsylvania: ASTM; 2005. Cheriaf M, Cavalcante Rocha J, Pérao J. Pozzolanic properties of pulverized coal combustion bottom ash. Cement and Concrete Research 1999;29(9):1387-91. Canpolat F, Yilmaz K, Köse MM, Sümer M, Yurdusev MA. Use of zeolite, coal bottom ash and fly ash as replacement materials in cement production. 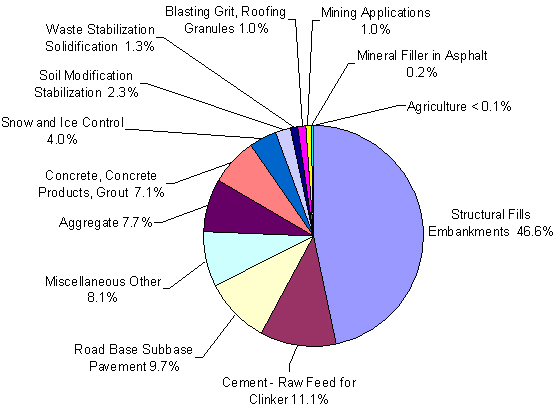 Cement and Concrete Research 2004 5;34(5):731-5. Vivek Tandon and Miguel Picornell. Safe disposal of fly ash in pavement or earth structures not requiring high strength materials. Proceedings of the Geo-Congress, Oct 18-21 1998, Boston, MA, USA: ASCE, Reston, VA; 1998. Environmental Protection Agency (EPA), Federal Highway Administration (FHWA). Using coal ash in highway construction - A guide to benefits and impacts. ; 2005. Report nr EPA-530-K-002:ID: 151. ASTM E2277-03 standard guide for design and construction of coal ash structural fills. In: Annual book of ASTM standards. West Conshohocken, Pennsylvania: American Society for Testing and Materials; 2003. Ksaibati K, Sayiri, S. R. K. Utilization of Wyoming bottom ash in asphalt mixes. Department of Civil & Architectural Engineering, University of Wyoming; 2006 March. Groppo J, Robl T. Construction fill sand production from bottom ash at Mill Creek Station. EPA; 2003 December. Case study No. 7. Özkan Ö, Yüksel I, Muratoglu Ö. Strength properties of concrete incorporating coal bottom ash and granulated blast furnace slag. Waste Management 2007;27(2):161-7. Kim B, Prezzi M. Compaction characteristics and corrosivity of Indiana class-F fly and bottom ash mixtures. Construction and Building Materials; In Press, Corrected Proof. Kumar S, Vaddu P. Time dependent strength and stiffness of PCC bottom ash-bentonite mixtures. Soil and Sediment Contamination 2004;13(4):405-13. Majizadeh K, Bokowski G, El-Mitiny R. Material characteristics of power plant bottom ashes and their performance in bituminous mixtures: A laboratory investigation. In: Proceedings of the fifth international ash utilization symposium. Morgantown, West Virginia: Department of Energy; 1979. Lovell CW, Ke TC, Huang WH, Lovell JE. Bottom ash as highway material. In: 70th annual meeting of the transportation research board. Washington, DC: Transportation Research Board; 1991. Andrade LB, Rocha JC, Cheriaf M. Evaluation of concrete incorporating bottom ash as a natural aggregates replacement. Waste Management; In Press 2007. Ke TC, Lovell CW. Corrosivity of Indiana bottom ash. Transportation Research Record 1992;1345:113-117. Tanyu BF, Benson CH, Edil TB, Kim W. Equivalency of crushed rock and three industrial by-products used for working platforms during pavement construction. Transportation Research Record 2004(1874):59-69. Huang WH. The use of bottom ash in highway embankment and pavement construction. Purdue University; 1990. p. 317. Tanyu BF, Kim W, Edil TB, Benson CH. Development of methodology to include structural contribution of alternative working platforms in pavement structure. Transportation Research Record 2005(1936):70-7. Edil TB, Benson CH, Bin-Shafique MS, Tanyu BF, Kim W, Senol A. Field evaluation of construction alternatives for roadways over soft subgrade. Transportation Research Record 2002;1786(1):36-48. Prakash K, Sridharan A. A geotechnical classification system for coal ashes. Proceedings of the Institution of Civil Engineers, Civil Engineering 2006 04;159(2):91-8. Siddiki NZ, Kim D, Salgado R. Use of recycled and waste materials in Indiana. Transportation Research Record 2004(1874):78-85. Tanyu BF, Kim W, Edil TB, Benson CH. Comparison of laboratory resilient modulus with back-calculated elastic moduli from large-scale model experiments and FWD tests on granular materials, In: G. Durham, A. Marr, W. De Groff, editors. Resilient modulus testing for pavement components. West Conshohocken, PA: ASTM; 2003. Moulton LK, Seals RK, Anderson DA. Utilization of ash from coal burning power plants in highway construction. Transportation Research Record 1973 (430):26-39. Bin-Shafique MS, Benson CH, Edil TB. Geoenvironmental assessment of fly ash stabilized subbases. University of Wisconsin – Madison, Madison, WI: Geo Engineering, Department of Civil and Environmental Engineering; 2002 March 11, Geo Engineering Report No. 02-03. Sauer JJ, Benson CH, Edil TB. Metals leaching from highway test sections constructed with industrial byproducts. University of Wisconsin – Madison, Madison, WI: Geo Engineering, Department of Civil and Environmental Engineering; 2005 December 27, Geo Engineering Report No. 05-21. Bin-Shafique MS, Benson CH, Edil TB. Leaching of heavy metals from fly ash stabilized soils used in highway pavements. University of Wisconsin – Madison, Madison, WI: Geo Engineering, Department of Civil and Environmental Engineering; 2002. Report nr 02-14. Li L, Benson CH, Edil TB, Hatipoglu B. Groundwater impacts from coal ash in highways. Waste and Management Resources 2006;159(WR4):151-63. In the United States, about 3.7 million km (2.3 million miles) or 55 percent of all roadways are surfaced with asphalt concrete, making asphalt concrete a critical component of the nations infrastructure. (1;2) Asphalt pavements in new roadway construction typically requires a large amount of virgin materials. Bottom ash and boiler slag can be used as an aggregate replacement, providing a substantial savings to both highway agencies and utility companies. Bottom ash has been used as aggregates in hot mix asphalt (HMA) base courses, in emulsified asphalt cold mixes, and in shoulder construction. Boiler slag has been used in the same applications as bottom ash and also as wearing surfaces, emulsified asphalt cold mix bases or surfaces, and asphalt surface treatments or seal coats. Bottom ash produced in dry bottom boilers is usually sufficiently well-graded to meet gradation requirements for asphalt concrete. However, bottom ash particles are less durable than conventional aggregates. Consequently, bottom ash is better suited for use in base course and shoulder mixtures or in cold mix applications, as opposed to wearing surface mixtures. Most bottom ash paving applications have been cold mix projects on low-volume secondary roadways. The most extensive use of bottom ash in bituminous paving has been in West Virginia, where, during the 1970's and 1980's, bottom ash was cold mixed with 6 to 7 percent by weight of emulsified asphalt and used in the paving of secondary roads where durability concerns are reduced. Similar paving has also been done in eastern Ohio. (6) To improve the characteristics of a cold mix containing bottom ash, boiler slag can be included. Oversize or agglomerated popcorn particles may be present in some bottom ash sources and should be removed by screening the material with a 19 mm (¾ in) or 12.7 mm (½2 in) screen. Boiler slag will almost always require blending with other aggregate sources to meet gradation specifications. Although more well-graded than boiler slag, bottom ash may require blending with aggregates. Aggregates used to produce HMA are dried before blending with asphalt cement; therefore, moisture that may be present in bottom ash or boiler slag should be removed. Excessive moisture in the aggregates will reduce the production rate of paving material due to the additional drying time required. Both bottom ash and boiler slag are relatively easy to dewater, particularly boiler slag, which consists of glassy particles. Ponded ash, which is usually a mixture of fly ash and bottom ash or boiler slag, should be stockpiled and allowed to drain to a surface dry condition. When used in a cold mix application, bottom ash should be at least surface dry so that moisture does not interfere with the coating of the ash particles by the emulsified asphalt. Boiler slag should also be in a surface dry condition when used as a seal coat aggregate. Properties of bottom ash and boiler slag that are of particular interest when used in asphalt concrete include gradation, specific gravity, absorption, and durability. Gradation: ASTM D1073 defines a fine aggregate in asphalt paving mixtures as an aggregate that passes the 9.5 mm (3/8 inch) sieve. (14) Boiler slag typically meets maximum size requirement for fine aggregate, while bottom ash sources may require minimal screening of oversize material to satisfy the definition of a fine aggregate. Because boiler slag is typically poorly-graded, blending with other aggregates may be needed to meet gradation requirements. Bottom ash is typically a well-graded sand-sized material. Specific Gravity:Specific gravity is a good indicator of the quality of a material. The specific gravity of bottom ash and boiler slag depend on the mineralogical composition of the material as well as the porosity of the particles. A dry bottom ash with a high iron content may have a specific gravity as high as 3.4,(12) while a bottom ash with a large percentage of both porous and popcorn particles may be as low as 1.6. (2) In general, the lower the percentage of porous particles, the higher the specific gravity. Durability: Bottom ash and boiler slag exhibit marginal durability as measured by the Los Angeles abrasion test, with bottom ash percent loss values between 30 and 50 and boiler slag somewhat lower. Most bottom ash samples have some friable particles, while boiler slag normally does not. Los Angeles Abrasion test results have shown that bottom ash samples are not as sound or durable as natural aggregate. However, the test results fall within the specifications of a maximum 50 percent loss by abrasion. Bottom ash is used less than boiler slag in asphalt paving because bottom ash has a higher asphalt absorption, some particles may be friability, and there is a potential for pyrites to be mixed into bottom ash from some sources. Most of the paving experience with bottom ash has been in cold mixes. The laboratory effort and method of compaction effects pavement properties of mixes containing boiler slag. Kneading compaction improves the stability and flow characteristics compared to Marshall drop hammer compaction. Obtaining adequate compaction is essential with boiler slag mixtures. Optimum compaction is produced by blending boiler slag with well-graded, angular, rough-textured aggregate and limiting the percentage of boiler slag to 50 percent. Porous boiler slag can be used in greater percentages, but excessively porous slag are weak and can crush. (21) In addition, porous boiler slag may absorb more asphalt than typical boiler slag, thereby requiring a higher percentage of asphalt cement. Similarly, pavement thickness design procedures for cold mix overlays containing bottom ash or boiler slag are the same procedures used for cold mix overlays using conventional aggregates. Modified structural numbers (SN) for cold mix overlays containing bottom ash and/or boiler slag are the same as conventional cold mix overlays. Bottom ash and boiler slag can be stored, stockpiled, and handled using the same methods and equipment as conventional aggregates. However, pyrites should be removed prior to using bottom ash in asphalt paving. Boiler slag mixtures with acceptable skid resistance that employ boiler slag as the top size aggregate can be designed by limiting the percentage of boiler slag in the mix. Boiler slag asphalt pavement mixtures should avoid open-graded mixtures with low filler content. Bottom ash that contains friable particles should be avoided in asphalt surface mixes unless precrushed before being mixed with asphalt. The performance of wearing surface mixes with precrushed bottom ash aggregate should be evaluated in comparison with more conventional asphalt paving mixes. Additional research into modifying bottom ash, i.e. sulfur modification,(18) to reduce friability and asphalt absorption is encouraged. 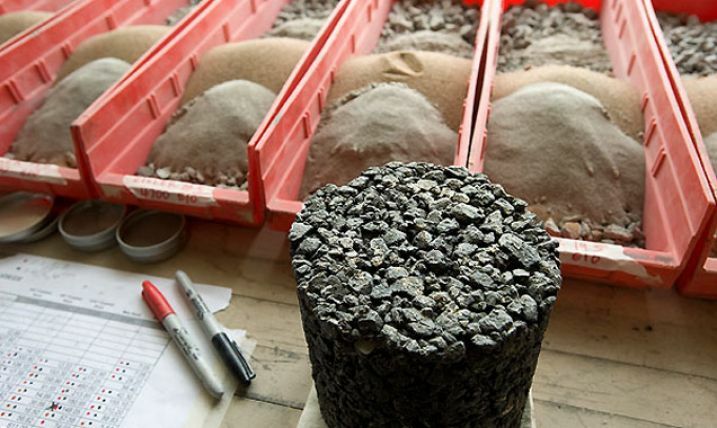 Bottom ash and boiler slag possess unique physical and engineering properties that are different from conventional pavement materials; therefore, standard test methods may reject bottom ash or boiler slags that would provide acceptable performance. New or modified test methods are needed to characterize bottom ash and boiler slag properties that influence pavement performance. Improved characterization is needed for both abrasion loss and particle size degradation that may occur during compaction. Ksaibati K, Conner GL. Laboratory evaluation of bottom ash asphalt mixes. Department of Civil & Architectural Engineering, University of Wyoming; Laramie, WY: 2004 May. Ksaibati K, Sayiri, S. R. K. Utilization of Wyoming bottom ash in asphalt mixes. Department of Civil & Architectural Engineering, University of Wyoming; Laramie, WY: 2006 March. NETL National Energy Technology Laboratory. Clean coal technology: Coal utilization by-products. Department of Energy Office of Fossil Energy; Washington, DC: 2006 August. Topical report no. 24. American Coal Ash Association (ACAA). 2006 coal combustion product (CCP) production and use. American Coal Ash Association; Aurora, CO: 2007. Robnett QL. Use of boiler bottom ash as a paving material A technical database. Georgia Institute of Technology, School of Civil Engineering; Atlanta, GA: 1983. Root RE, Williams EG. West Virginia turns waste material into useful aggregate. Asphalt 1976;29(2). Usmen M, Anderson DA. Use of power plant aggregate in asphaltic concrete. In: Proceedings of the fourth international ash utilization symposium, report no. MERC/SP-76/4. Washington, DC: U.S. Energy Research and Development Administration; 1976. Moulton LK, Seals RK, Anderson DA. Utilization of ash from coal burning power plants in highway construction. Transportation Research Record 1973(430):26-39. Kerkhoff GO. Bottom ash and wet bottom slag. In: Presented at the annual soils engineers meeting of the Michigan department of transportation. Lansing, Michigan: Michigan Department of Transportation; 1968. Cockrell CF, Shafer HE, Leonard JW. New or undeveloped methods for producing and utilizing coal ash. In: Proceedings of the second international ash utilization symposium, information circular no. 8488. Washington, DC: U. S. Bureau of Mines; 1970. American Coal Ash Association (ACAA). Boiler slag. American Coal Ash Association; Aurora, CO: 2004 August. Resource Bulletin 23. Huang WH. The use of bottom ash in highway embankment and pavement construction. West Lafayette, IN: Purdue University; 1990. p. 317. ASTM D1073-06 standard specification for fine aggregate for bituminous paving mixtures. In: Annual book of ASTM standards. ASTM; West Conshohocken, Pennsylvania: 2006. Moulton LK. Bottom ash and boiler slag. In: Proceedings of the third international ash utilization symposium. U.S. Bureau of Mines; Washington, DC: 1973. Ramme BW, Tharaniyil M. Coal combustion products utilization handbook. We Energies; Milwaukee, WI: 2004. Estakhri CK, Saylak D. Sulfur-modified bottom ash as aggregate in hot-mix asphalt concrete: Field demonstration project. Transportation Research Record 2000(1723):57-65. ASTM C88-05 standard test method for soundness of aggregates by use of sodium sulfate or magnesium sulfate. In: Annual book of ASTM standards. ASTM; West Conshohocken, Pennsylvania: 2005. Asokan P, Saxena M, Asolekar S. Coal combustion residues – environmental implications and recycling potentials. Resources, Conservation and Recycling 2005;43:239-62. Anderson DA, Usmen M, Moulton LK. Use of power plant aggregate in bituminous construction. In: Presented at the 55th annual meeting of the transportation research board. Washington, DC: Transportation Research Board; 1976. ASTM D1075-07 standard test method for effect of water on compressive strength of compacted bituminous mixtures. In: Annual book of ASTM standards. ASTM; West Conshohocken, Pennsylvania: 2007. AASHTO. Guide for design of pavement structures. American Association of State Highway and Transportation Officials; Washington, DC,:1993. Churchill EV, Amirkhanian SN. Coal ash utilization in asphalt concrete mixtures. Journal of Materials in Civil Engineering 1999;11:295-301. Coal bottom ash and boiler slag have been used as a granular base material in road and parking lot construction. Bottom ash or boiler slag need to satisfy material specifications for gradation, soundness, and abrasion loss. Bottom ash and boiler slag can be blended with natural aggregate to produce a mixture that meets specifications. Due to higher value uses of boiler slag, bottom ash is used more prevalently as a stabilized or unstabilized base or subbase material. Bottom ash has been successfully used as granular base since the early 1970's. The American Coal Ash Association reported that 740,000 metric tons (815,000 tons) of bottom ash were used as road base or subbase materials in 2006. (1) The road base or subbase category used by the American Coal Ash Association includes the use of coal bottom ash as an unbound base or in stabilized subbase or stabilized base material. Bottom ash is being studied and used as a granular base in both public(2;3;4;5) and private projects, although private use is not well documented in the literature. Bottom ash is typically free-draining, therefore, unless saturated, the moisture content has little influence on compaction characteristics. (6) Short-term stockpiling of bottom ash, typically less than two days, may be required to reduce moisture content. Reclaimed ponded ash may require longer-term stockpiling, up to two weeks, to reduce moisture content to an appropriate level. The moisture content of bottom ash should be high enough to prevent dusting during material handling. Bottom ash may meet granular base specifications without processing,(2;7) although the ash may require screening, washing, or blending with conventional aggregate to meet specifications. Oversize or agglomerated popcorn particles may be present in some bottom ash sources and should be removed by screening. Because boiler slag is a poorly-graded material, screening is typically not needed, but blending with conventional aggregate may be required. Engineering properties of bottom ash and/or boiler slag that are important in granular base applications are gradation, specific gravity, unit weight, compaction characteristics, degradation under compaction, shear strength, bearing strength (CBR), resilient modulus, corrosivity, and hydraulic conductivity. Gradation: Bottom ash and boiler slag are considered fine aggregates in a granular base. (9;10) To improve grain size distribution characteristics of bottom ash or boiler slag, a conventional aggregate or a slag aggregate may be blended with the ash. Specific Gravity: The specific gravity of bottom ash is in the range of 2.1 to 2.7,(11) but values as low as 1.9 and as high as 3.4 have been recorded. (12) Bottom ash with relatively low apparent specific gravity is often indicative of the presence of porous particles trapping gases that effect the test results. Bottom ash with relatively high specific gravity may indicate a high iron content. The specific gravity of boiler slag is in the range of 2.3 to 2.9. Bearing Strength: California Bearing Ratio (CBR) tests on bottom ash indicate that soaking does not negatively affect CBR. (12) Although the maximum CBR is obtained for bottom ash compacted slightly dry of optimum, where optimum is approximately a flushed conditioned, the general trend for CBR values is to increase with increasing moisture contents. (13) The CBR values of bottom ash compacted a high moisture contents were found to be higher (CBR 40 to 70) than the CBR values of bottom ash compacted at low moisture contents (CBR 35 to 60) indicating that compacting at high moisture contents is advantageous. In general, more coarsely graded and more angular materials tend to exhibit greater stiffness and tend to distribute load more evenly. When the same thickness is used, bottom ash exhibits less load distribution characteristics and would be more flexible than conventional aggregates, (15) even though bottom ash falls in the categories of "good subbases" and "good gravel bases" on the basis of CBR values.(13). Corrosivity: Bottom ash or boiler slag used as a granular base may potentially corrode metal structures. (16) Parameters of interest that are related to corrosivity are pH, electrical resistivity, soluble chlorides, and soluble sulfates. A study of 11 bottom ash or boiler slag samples from Indiana indicated that seven of the samples were considered corrosive, principally because of low electrical resistivity,(16) although pH measurements may exhibit high alkalinity indicating low corrosion potential. (17) Therefore, bottom ash, boiler slag, and ponded ash should be investigated for corrosivity with multiple methods if there is a potential that the ash will come in contact with metal. Hydraulic Conductivity: The hydraulic conductivity of bottom ash varies between 1 and 10-3 cm/s which is comparable to natural materials with similar grain size distribution. (18) Bottom ash is well draining material and is non-susceptible to frost heave. The physical properties of coal bottom ash, boiler slag, and ponded ash will vary depending on the type, source, and fineness of the parent fuel, as well as the operating conditions of the power plant;(19) therefore, material specific testing is recommended. A layer coefficient value of 0.10 can be used for the design of flexible pavement systems in which bottom ash, boiler slag, or reclaimed ponded ash are used to construct an unbound or granular base or subbase. A coefficient of 0.10 for bottom ash and/or boiler slag recognizes that bottom ash and/or boiler slag are not structurally equivalent to crushed stone, which is typically given a larger coefficient of 0.15. Compacted unbound bottom ash used as a working platform and subsequently as a contributing subbase member in flexible pavement design has been studied. (2;20;4)Laboratory and case study results show that with proper design and construction, compacted bottom ash provides adequate support as a working platform or subbase material. (2;20) Design charts for selecting the equivalent thickness of compacted bottom ash for working platforms are provided in reference 20, where a methodology for including the structural contribution of working platforms made from bottom ash or other alternative material is presented in 4. Both bottom ash and boiler slag can be handled and stored using the same methods and equipment that are used for conventional aggregates. Bottom ash and boiler slag can be dumped and spread with a motor grader or bulldozer or for more accurate grade control, these materials can be placed with a spreader box or paving machine. Bottom ash and boiler slag should be compacted at, or slightly above, optimum moisture content as determined by standard Proctor compaction procedures. (1) Bottom ash loses stability at low moisture contents; therefore, high moisture contents should be maintained to allow construction equipment to operate. The addition of up to 30 percent fines in the form of fly ash may remedy the loss of stability upon drying. (11) Compaction of bottom ash and boiler slag bases and subbases can be accomplished by static steel-wheeled rollers, pneumatic rollers, or vibratory compaction equipment. After compaction, a bottom ash granular base layer should be protected. A prime coat of asphalt emulsion can be applied to the base material to prevent moisture evaporation, stabilize the surface, and provide a bond between the base layer and an asphalt or Portland cement concrete wearing surface. An asphalt binder, wearing surface, or concrete pavement should be constructed within a reasonable time after sealing a granular base layer to minimize traffic loads on the base layer. Bottom ash and boiler slag aggregates possess somewhat unique engineering properties when compared to conventional aggregates. For example, bottom ash may contain some particles that can crush or degrade easily, while boiler slag is very uniformly graded. Some sources of bottom ash or boiler slag, which provide satisfactory performance as an unbound granular base, may not satisfy all specification requirements. This is particularly the case for particle size distribution specifications and abrasion loss requirements for graded base courses. Performance based specifications rather than material characteristic specifications would allow for an increased use of unconventional materials as unbound granular bases. Edil TB, Benson CH, Bin-Shafique MS, Tanyu BF, Kim W, Senol A. Field evaluation of construction alternatives for roadways over soft subgrade. Transportation Research Record 2002;(1786):36-48. Seals RK, Moulton LK, Ruth BE. Bottom ash: An engineering material. Journal of the Soil Mechanics and Foundations Division 1972 April; SM 4:311-25. ASTM. ASTM D1241-07 standard specification for materials for soil-aggregate subbase, base, and surface courses. In: Annual book of ASTM standards. West Conshohocken, Pennsylvania: ASTM; 2007. ASTM D2940-03 standard specification for graded aggregate material for bases or subbases for highways or airports. In: Annual book of ASTM standards. West Conshohocken, Pennsylvania: American Society for Testing and Materials; 2003. Lovell CW, Ke TC, Huang WH, Lovell JE. Bottom ash as highway material. In: 70th annual meeting of the transportation research board. Transportation Research Board; Washington, DC:1991. Usmen MA. A critical review of the applicability of conventional test methods and materials specifications to the use of coal-associated wastes in pavement construction. : West Virginia University; Morgantown, West Virginia: 1977. AASHTO. Guide for design of pavement structures. American Association of State Highway and Transportation Officials; Washington, DC,: 1993. Kim B, Prezzi M. Compaction characteristics and corrosivity of indiana class-F fly and bottom ash mixtures. Construction and Building Materials; In Press, 2007. Bottom ash or boiler slag can be used as the fine aggregate fraction or as the entire aggregate in Portland cement or pozzolan-stabilized base and subbase mixtures. Bottom ash and, in particular, boiler slag have been used as aggregate in stabilized base or subbase applications since the 1950's. Most installations have not been well documented, but there is no indication of unsatisfactory performance. In 2006, the American Coal Ash Association reported that over 740,000 metric tons (815,000 tons) of bottom ash were used as road base or subbase materials. (1) The road base or subbase category used by the American Coal Ash Association includes the use of coal bottom ash as an unbound base, stabilized subbase, or stabilized base material. Pozzolan-stabilized base compositions consisting of lime, fly ash, and aggregates (LFA) were originally patented in the early 1950's under the trade name Poz-O-Pac. Some of the first LFA compositions were mixed in place and used boiler slag as the aggregate. These early mixtures contained an average of 5 percent by weight hydrated lime, 35 percent Class F fly ash, and 60 percent boiler slag. Pavements using such mixtures provided many years of service and cores taken from these pavements have developed compressive strengths over 6900 kPa (1000 lb/in2). Bottom ash and boiler slag are both well-draining materials that can be dewatered in 1 or 2 days. Ponded ash, which typically contains fly ash, requires a longer time to dewater, up to two weeks. The higher the percentage of fly ash in ponded ash, the longer the dewatering time. Bottom ash is generally a more well-graded aggregate than boiler slag, which is normally more uniformly graded between the No. 4 (4.75 mm) and No. 40 (0.42 mm) sieves. Pond ash may be a blend of bottom ash and fly ash, and will vary in gradation, depending on the proximity to the discharge pipe in a lagoon. Bottom ash may contain some agglomerations or popcorn-like particles. These agglomerations should either be reduced in size by clinker grinders at the power plant or removed by scalping or screening at the 12.7 mm (½ in) or 19 mm (¾ in) screen. As produced, bottom ash may meet gradation specifications for stabilized base or may require blending with other coal combustion products or natural aggregates to meet specifications. Boiler slag, being poorly-graded, will require blending to meet gradation specifications. Well-graded aggregates normally require less activator or reagent than poorly graded aggregates in order to produce a well-compacted stabilized base. Engineering properties of bottom ash and boiler slag that are important when using this material as aggregate in stabilized base or subbase mixtures are gradation, specific gravity, unit weight, durability, and soundness. Specific Gravity: The specific gravity of bottom ash is in the range of 2.1 to 2.7,(5) but values as low as 1.9 and as high as 3.4 have been recorded. (6) Bottom ash with relatively low apparent specific gravity is often indicative of the presence of porous particles trapping gases that effect the test results. Bottom ash with relatively high specific gravity may indicate a high iron content. The specific gravity of boiler slag is in the range of 2.3 to 2.9. Soundness: The durability of an aggregate used in stabilized bases or subbases can be evaluated by the sodium sulfate soundness test. Bottom ash has had sodium sulfate soundness loss values that normally range from 1.5 to 10.5 percent. (5) Boiler slag has had sodium sulfate soundness loss values of between 1 and 9 percent. (5) Lower the specific gravity may indicate a higher percentage of deleterious material, which will be reflected in a higher soundness loss. For pozzolan-stabilized base (PSB) mixtures made with bottom ash or boiler slag and containing coal fly ash (along with lime, Portland cement, or kiln dust as an activator), the initial step in determining mix design proportions is to find the optimum fines content. This is done by progressively increasing the percentage of fines and determining the compacted density of each blend. Each blend of aggregate and fines is compacted into a Proctor mold using standard compaction procedures. Fly ash percentages ranging from 25 to 45 percent by dry weight of the total blend are suggested for the initial trial mixes. The optimum fines content selected by this procedure should be 2 percent higher than the fines content at the maximum dry density. The optimum moisture content must then be determined for this mix design. For cement-stabilized bottom ash and boiler slag mixtures, the only mix design consideration is the percentage of Portland cement. Trial mixes between 5 and 12 percent Portland cement are needed to properly stabilize bottom ash or boiler slag for use as a roller-compacted base course. The results of ASTM C593 compressive strength and durability testing should be the basis for selection of the final mix. The compacted unit weight of bottom ash or boiler slag mixes is lower than the compacted unit weight of stabilized base mixtures containing conventional aggregates. Consequently, a cement content of 10 percent by weight for a base course mix containing bottom ash or boiler slag may be equivalent to 7 percent by weight cement content for a similar mix containing a natural aggregate. A hierarchical approach in the mechanistic-empirical design method allows for varying levels of material characterization depending on project criteria. Mechanistic material properties such as dynamic modulus, resilient modulus, and Poisson’s ratio are employed to evaluate pavement performance. The levels in the hierarchical system can directly measure strength characteristics (level 1), can use correlations to develop strength characteristics (level 2), or can use typical material property default values (level 3). Both asphalt stabilized base materials and chemically or cement stabilized base materials are included in the mechanistic-empirical design method under different material categories. Both bottom ash and boiler slag can be handled and stored using methods and equipment that are used for conventional aggregates. The blending or mixing of bottom ash or boiler slag in stabilized base mixtures can be done in a mixing plant or in place. Plant mixing provides control over the quantities of materials batched, resulting in a uniform mixture. Mix proportions from in-place mixing are not as accurate as mix proportions from plant mixing, although in-place mixing of mixes containing bottom ash or boiler slag produce satisfactory stabilized base material. To develop the design strength of a stabilized base mixture, the material should be well-compacted at the optimum moisture content. To avoid drying, plant-mixed materials should be delivered to the job site as soon as possible and should be compacted within a reasonable time after placement. Crack Control Techniques: Stabilized base materials, especially those in which Portland cement is used as the activator, are subject to cracking. The cracks are typically shrinkage related and are not the result of structural weakness or defects in the stabilized base material. The cracks also not related to the type of aggregate used in the mix. Shrinkage cracks will reflect through the overlying asphalt pavement and should be sealed at the pavement surface to prevent water intrusion and subsequent damage due to freezing and thawing. An approach to controlling or minimizing reflective cracking associated with shrinkage cracks in stabilized base materials is to saw cut transverse joints in the asphalt surface that extend into the stabilized base material to a depth of 75 to 100 mm (3 to 4 in). Joint spacing of 9 m (30 ft) have been suggested. (9) Joints should be sealed with a material such as hot poured asphaltic joint sealant. As noted above, control of shrinkage cracking has been long considered by many state transportation agencies as a prime concern associated with stabilized base mixtures, especially cement-stabilized mixtures. Since most mixtures that include bottom ash or boiler slag as the aggregate have been placed on secondary roads, haul roads, and parking lots, as opposed to higher-type highway facilities, the issue of crack control has not been a major concern. However, additional mix designs with reduced potential for shrinkage cracking need to be developed, especially when these materials are used on higher-type facilities. Pyrites should be removed before bottom ash or boiler slag is used as aggregate in a stabilized base. Soluble sulfates in bottom ash may warrant removal if found in sufficient quantity to be considered detrimental. Improved techniques for economic removal of these constituents are needed. Halsted GE, Luhr DR, Adaska WS. Guide to cement-treated base (CTB). : Portland Cement Association; Skokie, IL 2007. Moulton LK. Bottom ash and boiler slag. In: Proceedings of the third international ash utilization symposium. U.S. Bureau of Mines; Washington, DC: 1973. 6. Lovell CW, Ke TC, Huang WH, Lovell JE. Bottom ash as highway material. In: 70th annual meeting of the transportation research board. Washington, DC: Transportation Research Board; 1991. ASTM C593-06 standard specification for fly ash and other pozzolans for use with lime for soil stabilization. In: Annual book of ASTM standards. ASTM; West Conshohocken, Pennsylvania: 2006. AASHTO. Guide for design of pavement structures. American Association of State Highway and Transportation Officials; Washington, DC: 1993. NCHRP 1-37A. Guide for mechanistic – empirical design of new and rehabilitated pavement structures. National Cooperative Highway Research Program, Transportation Research Board; 2004. White DJ, Harrington D, Thomas Z. Fly ash soil stabilization for non-uniform subgrade soils, volume I: Engineering properties and construction guidelines. Iowa State University, Ames, IA: Center for Transportation Research and Education Iowa State University; 2005. According to the American Coal Ash Association approximately 3.63 million metric tons (4.0 million tons) of bottom ash were utilized in structural fill and embankment applications in 2006. (1) Structural fill and embankment material is the largest use of bottom ash in the U.S. While specifications for bottom ash and boiler slag reuse depend on the application, there are material characteristics that must be met when using bottom ash or boiler slag in embankments or as a structural fill. Mechanical characteristics of bottom ash that are important when bottom ash is used as an embankment or fill material are: moisture-density relationship (compaction curve), hydraulic conductivity, particle distribution, strength, stiffness, and compressibility. Particle Size Distribution: Bottom ash is a well-graded material with particles ranging in size from fine gravel to fine sand with low percentages of silt-clay sized particles. Bottom ash is predominantly sand-sized, usually with 50 to 90 percent passing the No. 4 sieve (4.75 mm) and 0 to 10 percent passing the No. 200 sieve (0.075 mm). Top particle size for bottom ash is typically between 19 mm (¾ in) to 38.1 mm (1-½ in). Bearing Strength: California Bearing Ratio (CBR) tests on bottom ash indicate that soaking does not negatively affect CBR. (13) Although the maximum CBR is obtained for bottom ash compacted slightly dry of optimum, where optimum is approximately a flushed conditioned, the general trend for CBR values is to increase with increasing moisture contents. (9) The CBR values of bottom ash compacted a high moisture contents were found to be higher (CBR 40 to 70) than the CBR values of bottom ash compacted at low moisture contents (CBR 35 to 60) indicating that compacting at high moisture contents is advantageous. Table 2 in the Material Description section for Coal Bottom Ash\Boiler Slag lists typical values for engineering parameters of interest when designing with bottom ash or boiler slag. Prior to placement, a site should undergo preparations consistent with preparation requirements for soil fill materials. Construction equipment needed to properly place and compact bottom ash or boiler slag in an embankment or structural backfill includes a bulldozer for spreading the material, a compactor, either a vibrating or pneumatic tired roller, a water truck to provide water for compaction and to control dusting, and a motor grader where final grade control is critical. Bottom ash and boiler slag is typically dumped and spread with a bulldozer or motor grader in lifts no thicker that 0.3 m (12 in.) when loose. Bottom ash and boiler slag should be compacted at, or slightly above, optimum moisture content as determined by standard Proctor compaction procedures. (1) Bottom ash loses stability at low moisture contents; therefore, high moisture contents should be maintained to allow construction equipment to operate. The addition of up to 30 percent fines in the form of fly ash may remedy the loss of stability upon drying. (12) Compaction of bottom ash and boiler slag can be accomplished by static steel-wheeled rollers, pneumatic rollers, or vibratory compaction equipment. 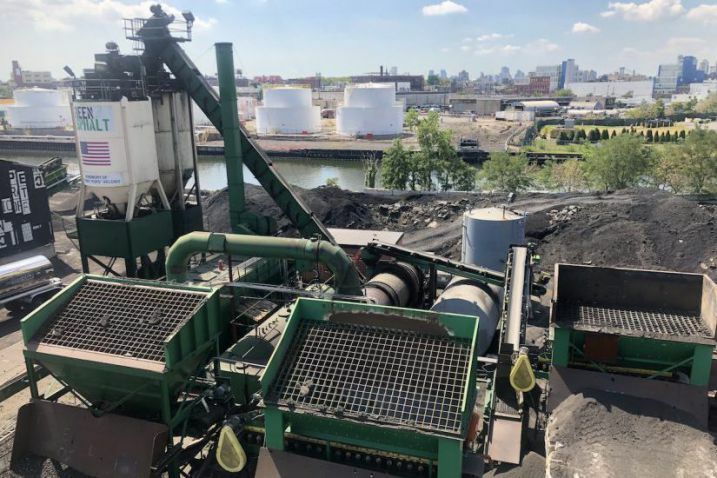 For each project, the type of compactor, the moisture content of the bottom ash or boiler slag at placement, the lift thickness, and the number of passes of the compaction equipment should be evaluated using a test strip. American Coal Ash Association (ACAA). 2006 coal combustion product (CCP) production and use. Aurora, CO: American Coal Ash Association; 2007. 2. Ramme BW, Tharaniyil M. Coal combustion products utilization handbook. We Energies; Milwaukee, WI: 2004. Wisconsin Transportation Information Center. Using recovered materials in highway construction. University of Wisconsin-Madison Department of Engineering Professional Development; Madison, WI: 1999. Wisconsin Transportation Bulletin No. 20. Edil TB, Benson CH, Bin-Shafique MS, Tanyu BF, Kim W, Senol A. Field evaluation of construction alternatives for roadways over soft subgrade. Transportation Research Record 2002(1786):36-48. Huang WH. The use of bottom ash in highway embankment and pavement construction. Purdue University; West Lafayette, IN:1990. p. 317 p.
ASTM E2277-03 standard guide for design and construction of coal ash structural fills. In: Annual book of ASTM standards. American Society for Testing and Materials; West Conshohocken, Pennsylvania: 2003. Lovell CW, Ke TC, Huang WH, Lovell JE. Bottom ash as highway material. In: 70th annual meeting of the transportation research board. Transportation Research Board; Washington, DC: 1991. Environmental Protection Agency (EPA), Federal Highway Administration (FHWA). Using coal ash in highway construction - A guide to benefits and impacts. 2005. Report nr EPA-530-K-002:ID: 151.